Alva is a Nord vampire sent by Movarth to Morthal to transform some of the townsfolk into vampires while using the rest as cattle. She is good friends with Lami (the proprietor of the Thaumaturgist's Hut), and is the lover of Hroggar, who is also her thrall (and therefore may not willingly love her). Normally, she will spend her day at either the Moorside Inn or the lumber mill. This changes once you talk to Thonnir during Laid To Rest, as she will begin sleeping in a coffin in the basement of her house during the day (from 6am to 10pm) while Hroggar guards the house. At that point, Alva will leave her house only at night and wander around, most likely looking for people to turn. She wears a set of tavern clothes and a pair of boots, and is equipped with a steel dagger. She carries a key to her house, at least one leveled soul gem with a small chance of up to four, and a significant amount of leveled gold, ranging from 50 to 250 gold. She knows the spells Vampiric Drain and Reanimate Corpse, which she will use when in combat. During the quest Laid to Rest, she is normally killed by you if she is in the house when you break in to get her journal. If she is not in the house, it is not necessary to kill her to complete the quest. If she is not killed she will be found in Movarth's Lair later on. Some other town members in Morthal will mention Hroggar's love for her and say they suspect he killed his wife and child to be with her, as he got together with her almost right after his house burnt down. If you have not yet discovered her secret, Alva will be quite flirtatious towards you if you are man (and not a Khajiit or Argonian), saying "Well, aren't you the handsome one. You and I should spend some time together." If you are female and not a member of the beast races, she will instead remark "Well, aren't you the pretty one. I bet all the men chase after you." However, if you have vampirism, she will drop all pretense and try to warn you off with "I know you for what you are. This town's blood is ours. Leave it! Now we must return to our roles lest the sheep suspect the wolves." She may also make ominous comments about the town's fate, saying "The people here work so hard, and they never allow themselves a moment of fun. It's such a pity. It won't last forever though. ", "These people are like cattle. All they do is work, sleep and eat." and "Gathering plants, picking mushrooms, brewing potions. It all gets so dreary after a while. This town needs something exciting to happen." Hroggar: "How are you feeling?" Alva: "I feel wonderful, just like every night." Hroggar: "Do you need anything? Are you hungry?" Alva: "Oh Hroggar, you know I'm always hungry. Don't worry, I'll eat when I need to." Alva: "Oh, look! We have company!" Alva: "Why, good evening Jonna!" Jonna: "What can I getcha, Alva?" Alva: "What can't you get me, sweetie?" Jonna: "Umm... Did you want somethin' to eat?" Alva: "Eat? No, I don't think I'm... hungry. Not now, at least." Jonna: "Right. Okay, tell me if you change yer mind." If Alva is not killed before raiding Movarth's Lair, she will be found there, fighting against other vampires, and will not be hostile toward you. This issue has been addressed by version 2.0.6 of the Unofficial Skyrim Patch; she is no longer hostile towards the other vampires and is hostile towards you instead. If she is not killed in Movarth's Lair at the end of Laid to Rest, she will be found back in Morthal a few days later. Attacking her is considered a crime at this point. This issue has been addressed by version 2.0.9 of the Unofficial Skyrim Patch; she will no longer return to Morthal once she goes to Movarth's Lair. Alva is one of the few NPCs to recognize you as a vampire regardless of the stage of vampirism. She is not actually a vampire by race, and her race is instead that of a normal Nord. 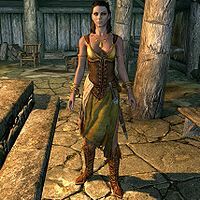 This means that her appearance will not change with Dawnguard installed. However, she will still use the Vampiric Drain spell, and the Sun Damage and Turn Undead effects do work on her. If you have already killed Laelette, Alva will comment "I hear you put Laelette out of her misery." This page was last modified on 22 November 2018, at 03:43.